With this feature, you can crop any edge of the frame: you just have to enable it and enter the amount of pixels you want to crop from each edge. Negative numbers are allowed: in most cases, they will add a black border to the picture. You can choose between three different cropping modes: "Destination", "Source", "Scale". Cropping is relative to pixels in the destination movie. The frame size of the resulting movie will be changed. Cropping is relative to pixels in the source movie. The frame size of the resulting movie will not be changed, and the picture is stretched to fit the destination frame size. 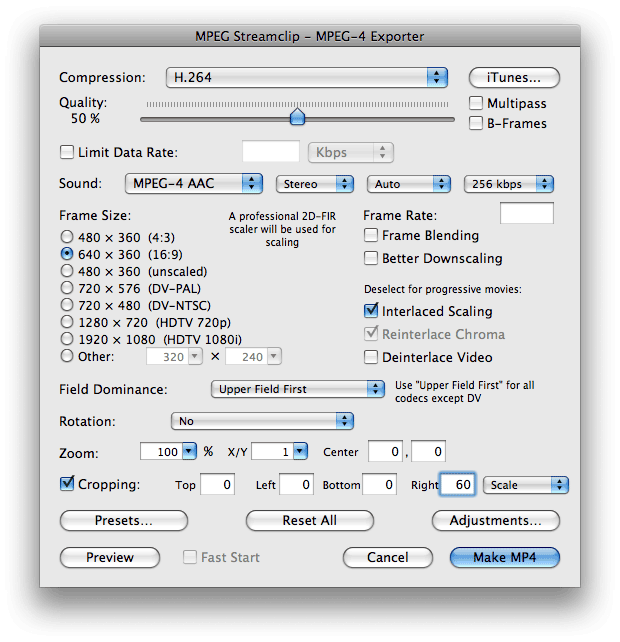 Note however that If you choose the "Destination" cropping mode with a DV frame size, MPEG Streamclip will use "Scale" instead.